Seattle ice cream company Full Tilt developed a limited edition Mudhoney ice cream flavor to honor the band's 25th anniversary. The cinnamon honey ice cream with fudge swirl -- packaged in pints decorated with the artwork from Every Good Boy Deserves Fudge -- are available to purchase at Stockbox in Seattle, and more grocery stores and restaurants in the Northwest will eventually carry the flavor. 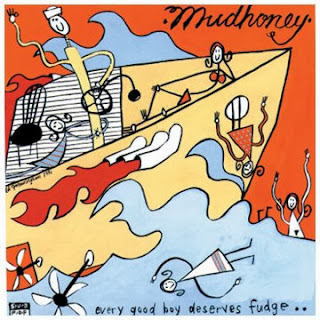 Unfortunately it doesn't sound like the Mudhoney ice cream will be available nationwide, but you can read more about it here.